It is, apparently, a 1972 model. It's a bit rusty and hasn't run in probably a decade. Other than that it looks in pretty good nick. 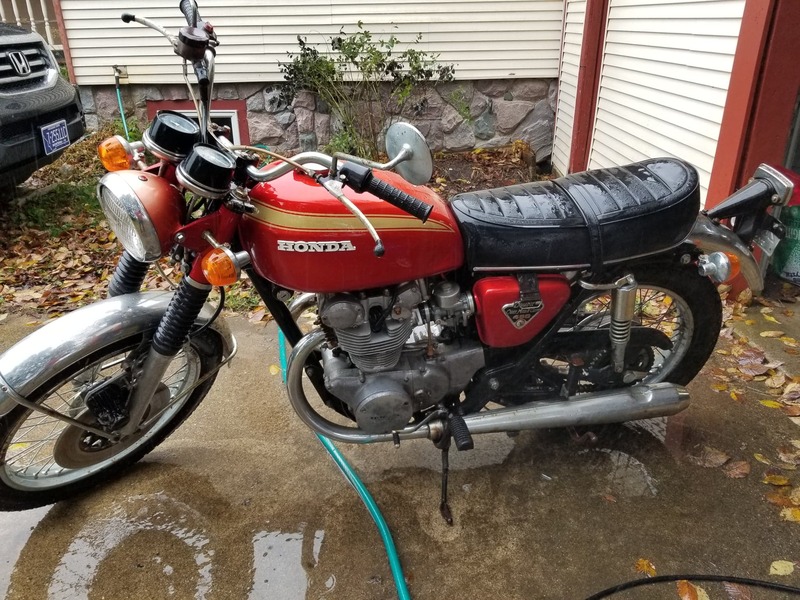 As the title suggests, this is my first CB450 (and my second ever old Honda twin) so I figured I'd ask here for some advice. 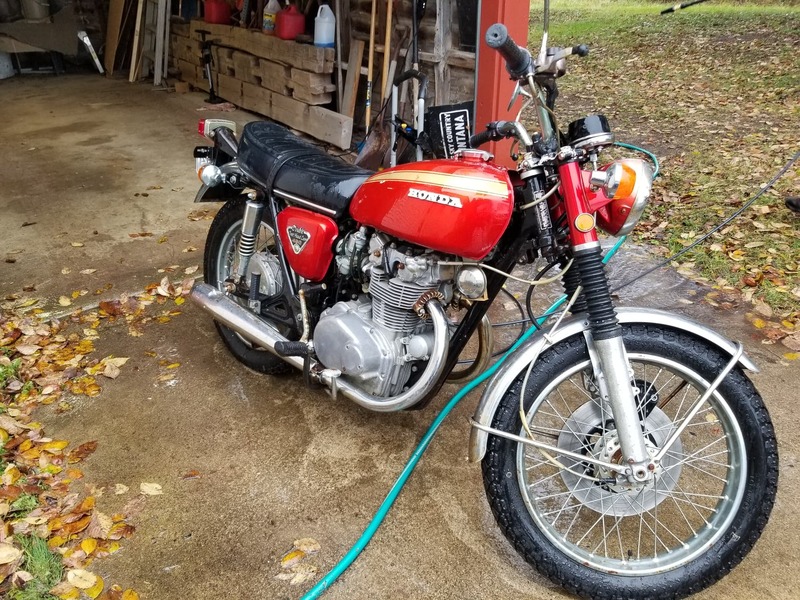 What should I look out for with the CB450? Any common failure spots? Any known troubles? Gimme the good, the bad, and the ugly please. First and foremost, download a copy of the factory service manual. Don't even bother with Haynes or Clymer. 1. Change the oil. Note if it smells like gas while you're at it. 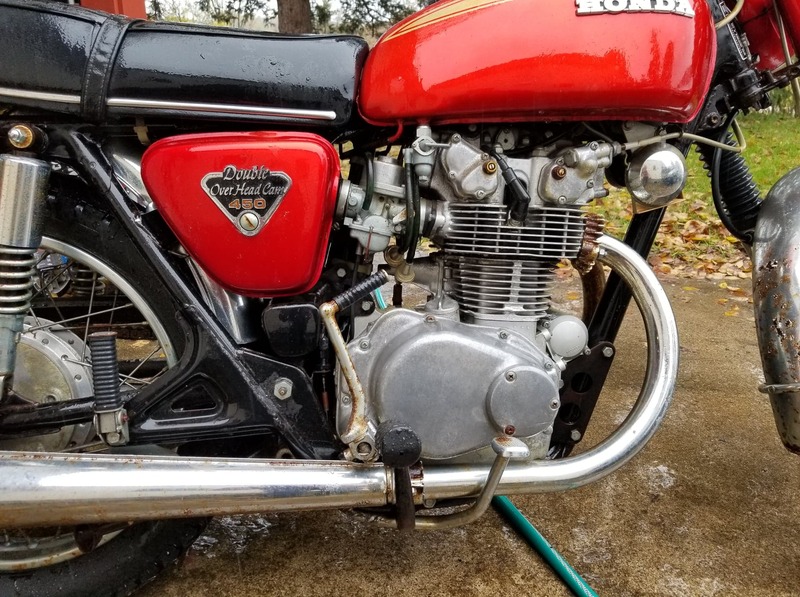 These bikes are notoriously for having the carbs leaking into the cylinders if the petcock is left on. 2. Check cam timing, chain tensioner, check valve clearance and adjust as needed. Better follow the service manual on this carefully since it is very crucial that your cam followers (The "T" notches) be oriented away from the engine (See the FSM on page 22) or you could risk catastrophic failure/damage to the valves. 3. 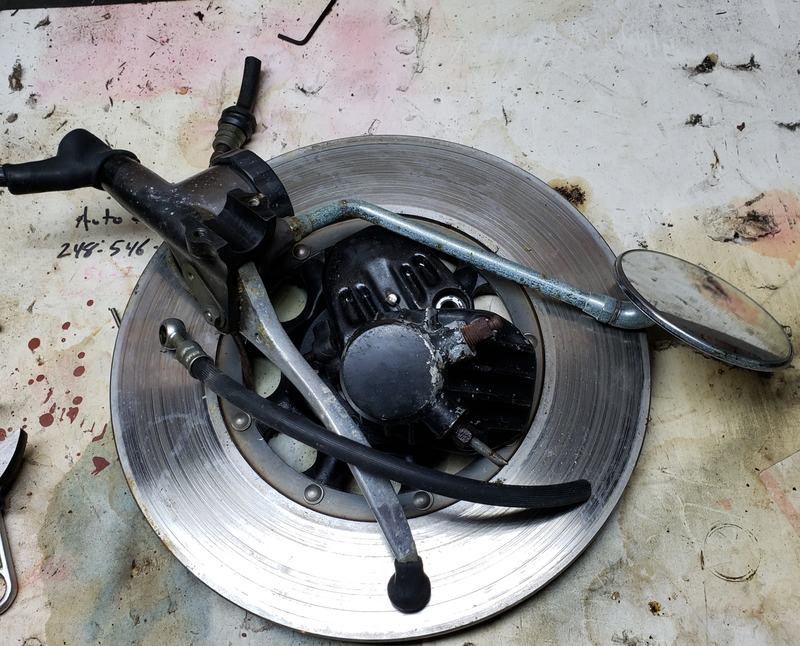 Open up the right crank case cover and clean out the oil pump/slinger. You'll need a special spanner wrench for this or you can make one. Last edited by 76TWIN; 11-02-2018 at 02:58 PM. 76twin pretty much said it all. 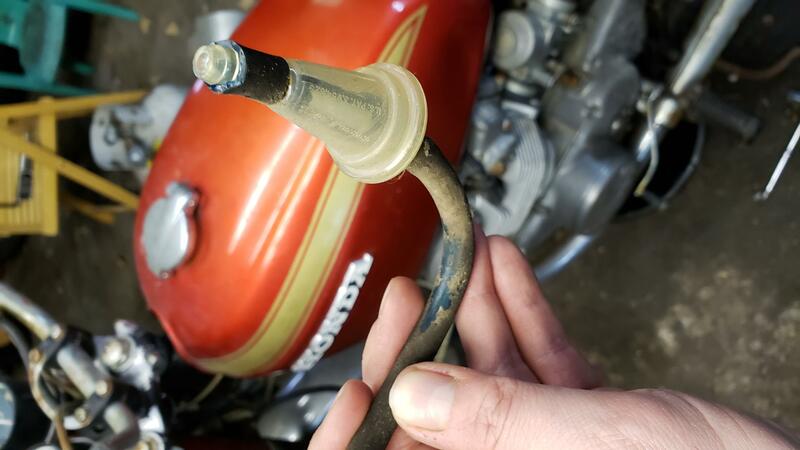 The cam followers are known to wear out, but I think keeping fresh oil in it and making sure you let it warm up at a low idle for a minute or so before riding helps a lot. It takes that long for oil to reach the cams. 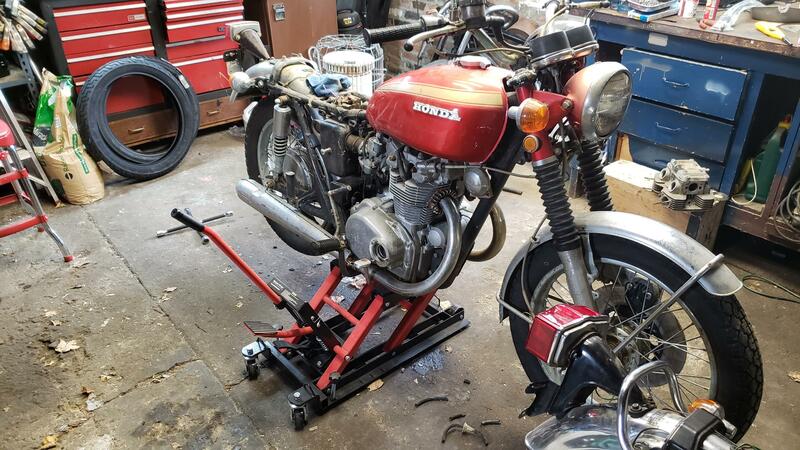 So, after getting the CB200 mostly done I finally moved the CB450 into the active work area. 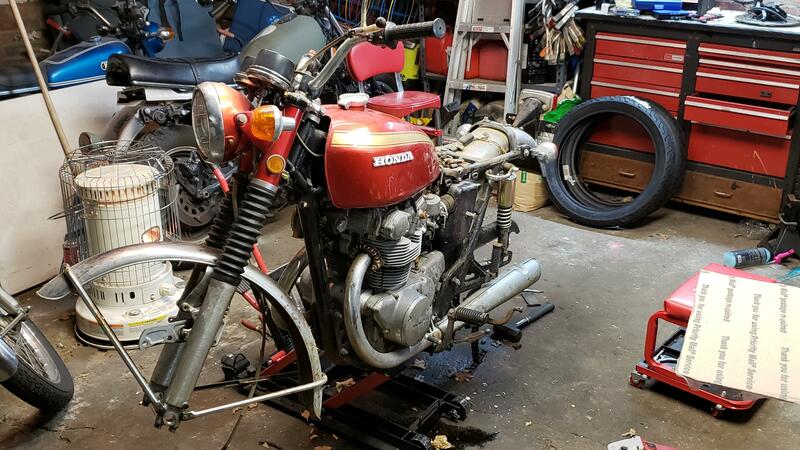 I got a full tune-up kit, a full front brake system replacement since the stock system was seized/destroyed, new tires mounted, a bunch of new o-rings, carb rebuild sets, and some other miscellaneous parts. I cleaned out the oil flinger and changed the oil. Gonna re-mount the wheels, drop a battery in it, and see what happens next. 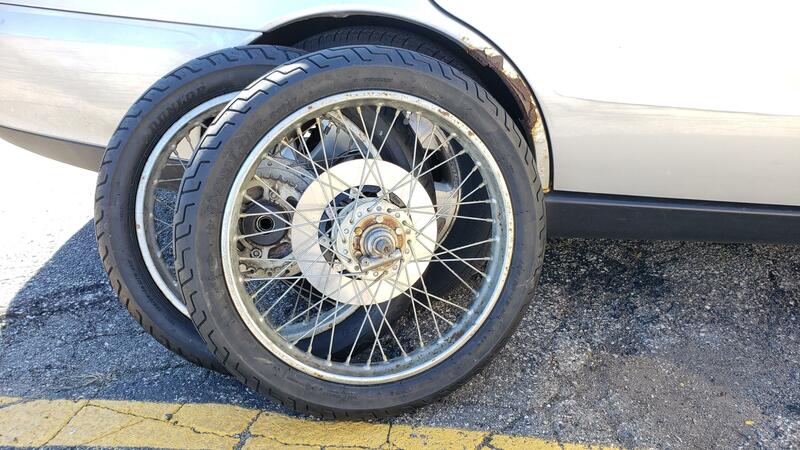 These tires are from 1977 and they still hold air! This extra wire is apparently factory, but what is it? 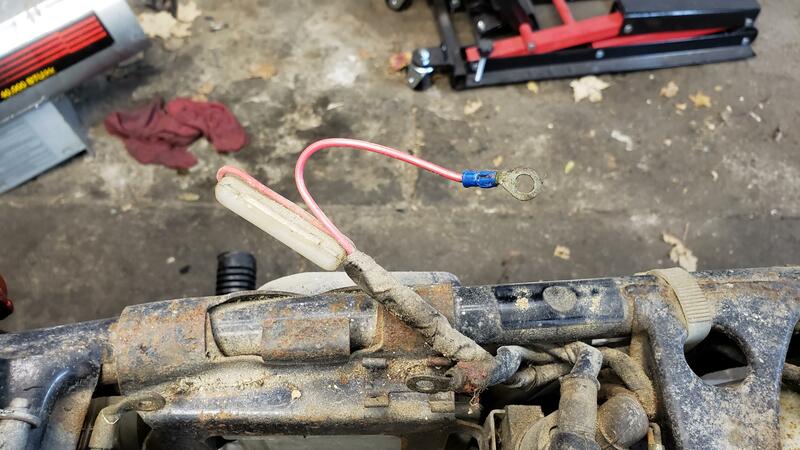 These old blue fuel lines are kinda brittle. 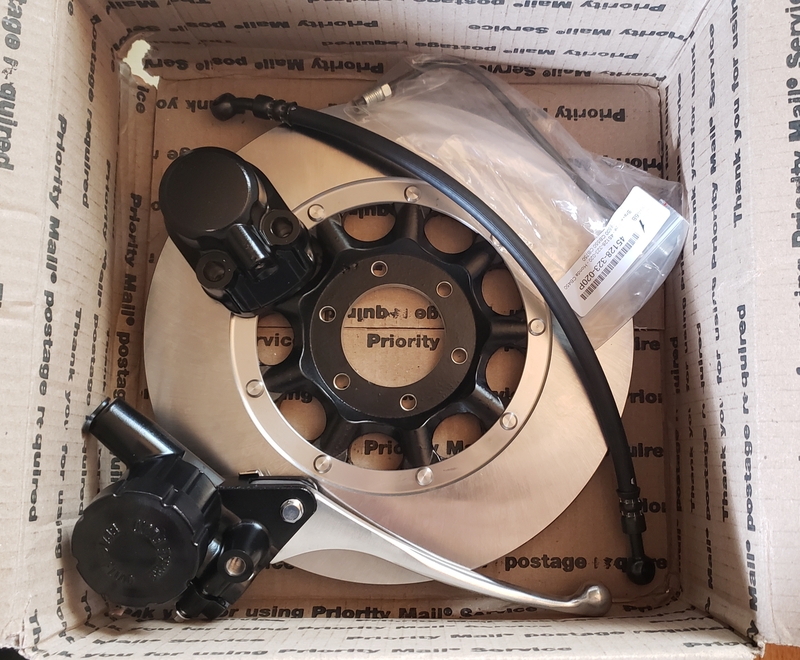 Love that new parts smell. So, that's how it stands now. I'll have more pictures of my CB450 adventures as they happen. Hopefully I won't find anything near as ugly in this bike as I did in the CB200. 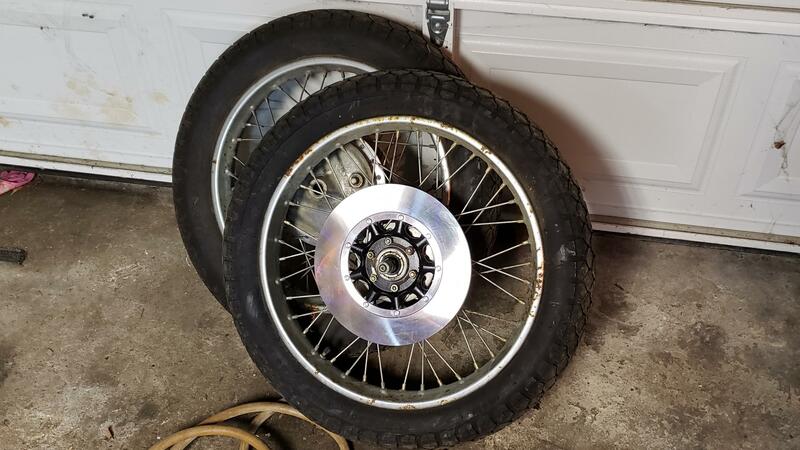 Wondering how the wrong brake caliper fit on that 71 model bike? 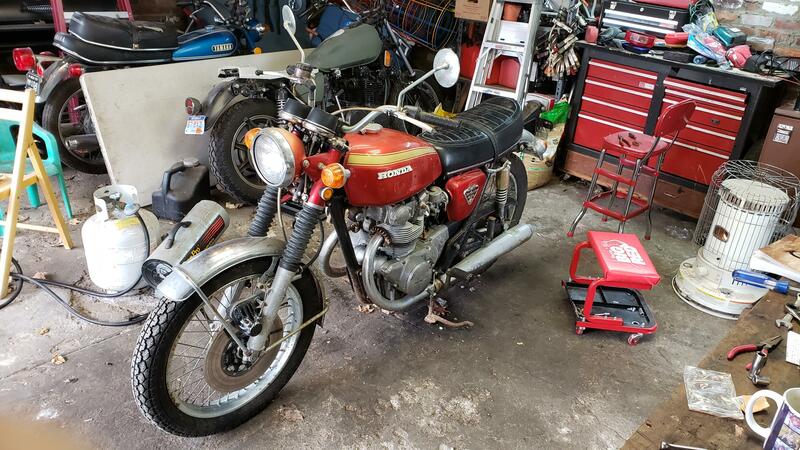 Title may say 72 but 70-71 had that sized brake caliper, different forks, body painted fork shrouds/headlight ears and headlight housing, and the flip up seat, not side opening. That is what my silver one used to look like or so I'm guessing from what was left of the paint on the old tank it had before I tossed it. I have same front end as yours and it is different from the 72-75 models. I kept the old brakes they are about 25% larger than the later ones and have 25% more brake pad catching the disk. It stops better than my lighter smaller 360. If you haven't already mocked up the caliper to the arm you might want to do so to verify it will fit as I am not 100% sure it will. 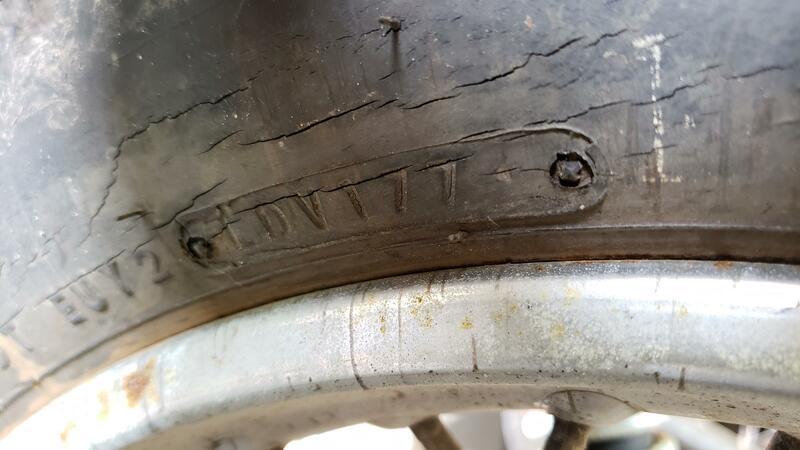 I'm thinking the bolt holes are wider apart.